Home > Cordless Phone > CBC909: 3.6v 720mAh Cordless Phone Battery (Ni-MH) for Uniden. Made with 3 x AAA cells & BLACK connector. CBC909: 3.6v Ni-MH battery for Uniden cordless phones and more. Pack size: 1 3/4" long x 1 1/4" across; made with 3 x AAA NiMH cells & BLACK connector. Standard capacity is 720mAh. Upgrade to 800mAh ENELOOP for $4.00 extra. Eneloop cells are PRE-CHARGED & READY TO USE. Also, ENELOOP cells retain their charge much longer when the phone is left off the charging cradle. 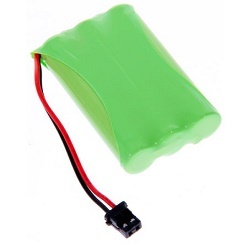 UPGRADE to 1000mAh NiMH for $6.00 extra. Upgrade to 950mah Eneloop Pro Ready-to-use for $ 8.00 more. These battery packs are manufactured in the USA by Batteries America. TRU8885-2, TRU8860, TRU8860-2, TRU8865, TRU8865-2, TRU8866, TRU8880, TRU8880-2, TRU8885, TRU8885-2, TRU8885-3, TRU8888, TRU9260, TRU9260-2, TRU9260-3, TRU9260-4, TRU9280, TRU9280-2, TRU9280-3, TRU9280-4, TRU9360, TRU9360-2, TRU9380, TRU9380-2, TRU9460, TRU9460-2, TRU9465, TRU9466, TRU9480, TRU9485, TRU9485-2, TRU9488, TRU9496, TWX9777, TXC-400, TXC146, TXC580, UIP165P (VOIP), UIP1868P (VOIP), UIP1869V (VOIP), WHAM X4 series, WXI377, WXI477, etc.